Located right in the centre of a 120 mile long Diocese, spanning from the Northern town of Beguildy to the beautiful Gower Peninsular in the South, Brecon Cathedral promises to give you a wonderful day out. It is ideal for those who want a breath of fresh air and to immerse themselves in some local history. 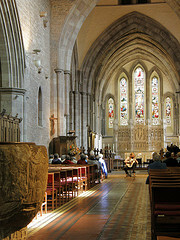 Established as a Cathedral in 1923, Brecon Cathedral was originally the Parish Church of St. John the Evangelist. The site has been associated with religion as far back as 1093 when a Norman Benedictine Priory was founded there. It is also widely speculated that before the Priory, the site was home to a Celtic Church. There is plenty to see and the Harvard Chapel inside the Cathedral is well worth a visit as it became a War Memorial in 1923 to the Monmouth Regiment, who served in WWII and the South Wales Borderers who fought in the Zulu War of 1879. If the Chapel isn’t brim-full of history enough, the Font is a feature not to miss. The largest Norman font in Wales, make sure you take a close look at its grotesque carvings. The Pilgrims Tea Rooms are the perfect place to stop for a bite to eat or a snack when your exploration has worked up an appetite. You can grab a coffee, indulge in some award-winning home cooking or push the boat out on afternoon tea. When you’re refreshed why not wander around the monastic buildings of the Cathedral Close and pay a visit to the Heritage Centre – an extremely popular place for tourists to discover more about the Cathedral and its surroundings. It offers a detailed insight into the history of Brecon Cathedral all the way back to its founding in 1923. Visitors have the opportunity to get interactive with the videos and audio guides available. And for those of you who are looking to purchase presents or memorabilia, the gift shop has a selection of Cathedral souvenirs.